Trojan is back again and there's no mistaking that the emphasis here is on style and luxury. This one's got enough pizazz, elan and machismo to be marketed with success on the Mediterranean with the best of the Italians. 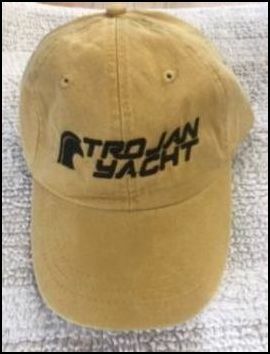 You aren't likely to mistake the new Trojan with the earlier models that came out of Bertram-Trojan, Inc. that had the reputation for extremely rugged hulls. 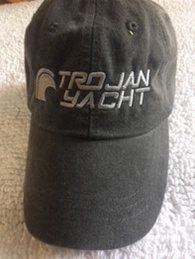 The Trojan name is now marketed by Carver, in turn owned by Genmar Holdings, Inc.
As we frequently point out, it takes more than style to make for a good quality yacht. Looking good and being good are entirely different things. This boat is intended to wow you, as so many try do these days. But let's have a look at what's behind the surface appearance. Our subject model here (1996) was being sold after about 20 months ownership and is very well cared for. Far and away the first thing to capture attention here is the trunk (I think the English call it a bonnet), which is intended to store your personal watercraft, launched by a nifty electric davit that's tucked out of the way in that space. The space back there is huge, but let's suppose that you weren't interested in a personal watercraft. What would you do with all that space? And what do you do when the electric opener craps out? You can see in the photo below that the amount of leverage on those two cylinders is enormous, causing them to strain under the load. This does not look like a 44 footer, in part because of the 4-5 linear feet of the lower stern area that makes it look that much shorter. But the cockpit area is considerably smaller than on similar boats. That's the trade-off for the trunk. One thing you can complain about is that boarding can be difficult; the only easy way is from the stern platform (assuming that is possible), which is low, while the side gunwales are high with a big drop down into the cockpit and no place for steps. To board on the port side you have to walk on the upholstery. After all, you don't let the kids jump on the furniture at home, do you? With a short dock, you've got to dock stern-to, and unless you like dirty footprints on your nice white upholstery, this forces you to board on one side only. Which, in turn, forces you to always try to dock starboard side-to. The design looks great, but there are some serious impracticalities. Of course, the uninitiated would never notice these things, which is why we write these reviews. The cockpit is filled with gleaming white upholstery. Situated out in the open as it is, need we say more? Its too heavy to be moving around, so that a few years down the road it's not going to look so good. You have to keep the covers on when not in use, but the ability to actually get the covers on is another story. The way these were laid out were very hard to reach. Next is a step up into a cockpit which is, well, elegant. With a white upholstered wrap-around settee to port and a rather nice looking bar set up opposite, there's adequate of space for a social gathering without being too cramped. But you do pay a large price in loss of space for that maybe useless trunk. Personally, I'd rather forego the trunk in favor of more cockpit area. Although when you compare this to the Sea Ray 500 Express, they're about the same. 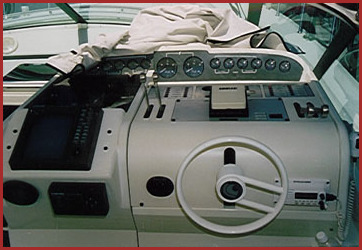 This seating area is divided off the helm area by the double wide pair of helm seats that are sculptured like pseudo bucket seats, all this behind a very large and sweeping wraparound windshield. A windshield of painted aluminum that is already corroding badly. This will be a major bleeding sore for the next owner. There are Bowmar hatches in the foredeck that, when you step on them, sag a good two inches. We have to wonder if the Bowmar people sell these things with a straight face. No, they don't break; you just think they will. When the plastic deflects, it just breaks open all the caulked seams. Don't worry, when it starts leaking, it will only go all over your bed. 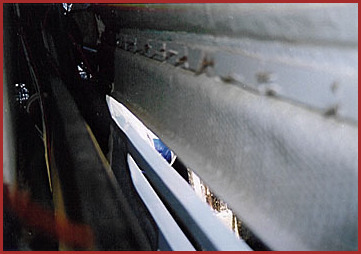 You're not likely to be very happy with all the aluminum on this boat either, from the large aluminum arch which is corroding like gangbusters, to the windshield and companionway door which was not properly aligned, would not close completely and leaked water into the cabin. Yes, every stainless steel fastener and every point of attachment had big corrosion blisters all around them. They didn't even bother to prime the aluminum properly before painting it. In another year or two, all of this aluminum is going to be a very unsightly and costly mess to attempt to refinish, which it can't be because its not made right in the first place. Like the football announcer exclaims when the wide receiver fumbles on the two yard line, "Oh, my!" Ah, well, it's only money folks, we gotta keep the boat yards going. Open wide .... Say Ahhhh. A large curved, sliding door leads into the main salon area which is in the great cabin style with galley contained therein. The entire starboard side is leather lounge seating with entertainment center built in behind it. Huh? Entertainment center behind the lounge, you say? Yes, a small 15" TV is built into the bulkhead on the opposite side, at ceiling level, but the first thing that caught my attention was that the space for your entertainment stuff is behind the lounge. Hmmm. Not exactly the way I'd want it. It's not convenient looking up at the ceiling and not many people have eyes in the back of their heads. Then you've got to climb onto the leather seats to reach whatever you put in the entertainment center. The leather on the L lounge is very soft, and very thin; it's not going to hold up well. Quality material it is not. The seat cushions, attached to plywood backing, are pie-shaped, with the large end in. We couldn't just lift one out to get to the storage space beneath, but had to start at one end and take all of them out to remove one in the middle. Not too convenient. 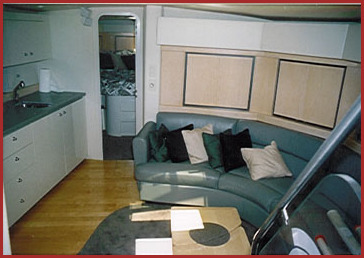 This is a two stateroom layout with the usual center-positioned double bed in the forward cabin. Its end loading with no side isles. Hope you like crawling into bed on hands and knees. It's fun to try to make up the bed too. Have you ever tried to make up a bed while you are on it? There's no choice because you can't reach the sides and other end. Hopefully your servants will be doing this for you. The aft cabin is really little more than a sleeping hole with a double berth that's even more difficult to make up than the forward berth. Close the door and the stand up space is no more than a phone booth. I'd really call this a party boat, not a cruiser, so you don't really expect all that much. 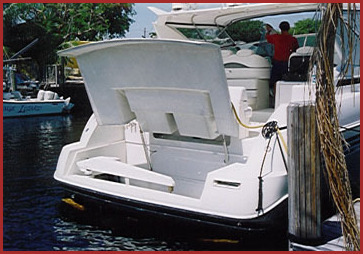 But the lack practicality is likely to overwhelm the experienced boater at times. The forward head has a nice full glass liner and a wildly curving shower stall of . . . . what, Lexan, Plexiglas? Something like that. In any case, the first thing I did was to walk straight into it. No, I don't have bad eyesight; it's just that it's hard to tell where that "S" shaped panel begins and ends. Maybe after the plastic gets all scratched up it will be easier to notice. I can appreciate modernist design as well as anyone, but this is strictly for show. You can imagine what's going to happen when someone tries a little abrasive cleanser on that. In any event, its definitely eye-catching if you notice it in time. The aft head, with doors to both the aft stateroom and main cabin is decidedly too small, while the salon area is plenty big. The doors get tangled up when you try to open both, and the space is so small that you can't open the vanity cabinet without first opening the entrance door because there isn't even room to bend over. More thoughtful design. 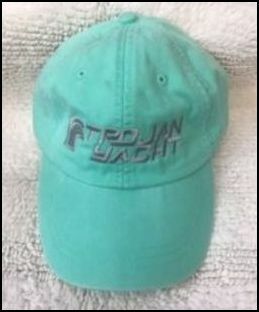 Then there's a huge 1" thick chunk of clear plastic acting as a railing for the companionway steps with the Trojan logo carved into it. Some might call it tacky. Others might simply object to having the builder's logo in your face, which, by the way, is rather prominent all over the boat, from the logos in the seat cushions to extra large name plates and stenciling on the transom. It's about like having "Arvida Homes" carved in your front door. Sort of make me wonder how long it's going to be before we start seeing the first Calvin Klein or Tommy Hilfinger editions. I do like the galley with the imitation granite counter-tops and a positively huge stainless sink with a decent fixture above it. It also has panels to cover the sink. Now, why you'd have this neat galley with enough space to cook up a real meal on a two burner hot plate that is supplied is a bit of a mystery. No, I think this is really just a large bar disguised as a galley. Only thing it's missing is a dedicated ice maker which is out in the sun in the cockpit. Yes, you should always put the ice-maker where the sun will beat down on it and turn the individual cubes into a block of ice. Still and all, if you wanted to cook a meal, all you'd have to do is install a decent stove. Meanwhile, drink up, this is a heck of a bar area! We could tell very little about the hull construction because so little of it was accessible. If you punch a hole in the bottom, forget about doing anything about that. Call 911 and your insurance agent. 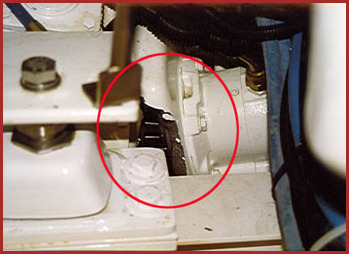 Nowadays, internal hull access is no longer considered to be important. Until you have to tear the boat apart to repair something, and face a huge repair bill. Trying to find where various equipment, pumps, motors, through hull fittings and such was extremely difficult to locate. The foredeck seemed solid enough, but when you walk on the cockpit hatch covers they sag noticeably. It's nice to have lightweight hatch covers, but these are too light and they rattle while underway. Except for the carved Trojan railing, the interior is for the most part tastefully done in light to dark grays with a backdrop of maple cabinetry and a planked maple floor in front of the galley, which is a decidedly bad idea because it is very slippery when wet. Maple is one of the worst choices of wood to use on a boat, the others being oak and ash. They all turn black with exposure to salt water. Less than two years old and it's already not looking so good, particularly around the leaking portholes. There is a fold-out, pneumatic maple hi-lo table that is all falling apart at the joints because the carpenters didn't joint it properly. And let me say here that the owner of this boat is very meticulous. I got my fanny reamed good by the owner for not getting the carpeting put back down exactly right. Carpeting which is all tacked down with those nice steel tack strips that are now all rusty, ugly and making a big mess of things. He was probably more mad at Trojan for the unbasted edges of the carpeting that was unraveling and leaving large amounts of carpet fibers all over the place. Apparently you're not supposed to ever lift the carpet and look in the bilge. There isn't much access anyway. And Trojan is still using those nice-looking, but ever-leaking stainless port holes, the leakage being no exception in this boat. The ports are framed out with maple, so I needn't describe what's going on here. These ports will not seal, and you'll have to live with the damage these leaks cause. They almost got the ergonomics of the helm right. No one with less than a 44" waist line is going to have trouble standing up or sitting down steering. But from here it's downhill all the way. You can see over the bow just fine, but to take advantage of the windshield wipers, you have to bend over and sight along the deck. Of course, it's never going to rain, so not to worry. I'm not thrilled with the panel design, which is overly fancy at the expense of practicality; all of the labeling is stenciled on with paint, and you know what will happen to that after a few years. They tried to get fancy with the shift and throttle controls and really botched it. The shifter lever end knobs are only 1-1/4" apart so that when trying to work them independently, the knuckles on your hands collide. I guess the designer didn't know that you have to use two hands to operate them. Or more likely hadn't ever operated a boat long enough to know this. And the narrow, cylindrical shape of the lever ends is decidedly uncomfortable. Here's yet another case of an attempt to get fancy that has resulted in a design disaster. There are places to flush mount instruments, but I wouldn't say that they are quite the right places. Look at where the VHF and autopilot had to be located in the photo below. Now imagine trying to pick out the controls you need to use with these instruments being located at your waist. The Teleflex tilt steering wheel is painted aluminum and is, um, well, you know . . . . . corroding. This is amateur design at its worst. For such a big boat, engine room access is clumsy and difficult. I'd describe the overall layout as poor. 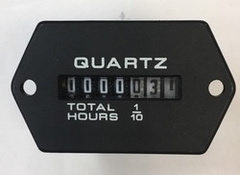 The bank of four 4D, 12 volt batteries is located outboard of the port engine and requires a contortionist to reach them. Here we go again. There's no way I could. Batteries never need to be serviced anyway, right? When they crap out because you're not willing to kill yourself trying to service them, just write a check for someone to install new ones. No problem, that's only about a grand or so. And hope they don't do a ton of damage trying to get 100 lb. batteries into this inaccessible space. Trojan apparently figures you're rich guy and you can afford it. This is inexcusable. "The radiographs attached in appendix A show that the general casting quality is poor. The casting contains porosity shrinkage and is a grade D material (lowest of casting grades) . . . . the sample is brittle . . . and does not have high strength or impact resistance. This is a poor grade of casting." Not very reassuring, is it? This analysis came about after our learning of 7 cases of Z-F aluminum gearboxes failing, and several lawsuits, so we decided to find out why this was happening. Just so you know that we're not talking through our hat, here's a shot of an aluminum Z-F gearbox broken in pieces. Inside the red circle, the gears are exposed. This boat hit a coral head, damaging only the propellers, but broke BOTH gear boxes in this boat into a minimum of a dozen pieces each. These things shattered like hitting glass with a hammer. We've noticed that Cat is not putting much paint on their engines these days, and we were surprised to see the engines starting to rust already. One thin coat of white enamel and no evidence of primer. The large amounts of salt spray that was entering through the huge, unfiltered hull side vents was starting to rust them up good, along with everything else down there. The salt spray was bad enough that it already corroded the heavy duty stainless steel exhaust system clamps to the point of breaking. This is a serious design fault that's going to cost the owner a lot of dollars. Salt is not recommended for seasoning machinery and electrical apparatus. The engine compartment isn't going to win any awards for neatness; its ho-hum okay. Once again, the builder didn't much care about what the customer had to do or pay for maintenance. They could have provided room to get around one end of the engine or the other, but didn't. Even in this large space, only a very small person can get to the outboard sides. You have to crawl on your belly over the tops of the engines. And yes, it's painful getting torn up with all that sharp metal. Sharp corners and edges everywhere. There is adequate space that they could have placed the engines so you could reach things for servicing. Instead, you have that huge trunk back there for your personal watercraft storage, assuming that you just have to have one on your yacht. The aluminum diamond plate decking is murder on your knees, but at least you don't have to stand in bilge sludge like many other boats. And that foil over foam insulation on the underside of the deck? Yep, its already starting to fall down. Nothing like using tape and adhesives in hot engine room. Don't worry, the warranty will run out before it all falls down. Engine mounts are Bushings, Inc., single vertical stud type in a rubber donut, allowing 360 degree movement. They are already badly distorted and misaligned. With vee drives, engine stability is doubly critical, but these mounts just aren't going to do the job. We really get tired of explaining the problems these el cheapo mounts cause, but builders go right on using them because they cost about 1/4 of what a good mount costs. Plus there are 8 of them, so what they save on the cheapos comes to some serious dollars. 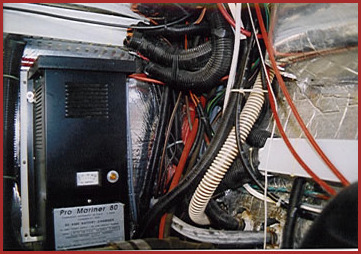 For the price of this boat you'd think they'd do a bit better job of the wiring and plumbing than this mess. Here there is wiring, water hoses, hydraulic hoses and engine control cables altogether. These four hull side vents, up to 40" long are channeling salt spray straight into the engine room. What you see at upper right is the hull/deck join. Imagine what happens when this area bumps a piling. These four hull side vents, up to 40" long are channeling salt spray straight into the engine room. What you see at upper right is the hull/deck join. Imagine what happens when this area bumps a piling. Performance wise, she's no speed demon, even with a fairly shallow vee bottom running to about 14 degrees dead-rise aft. 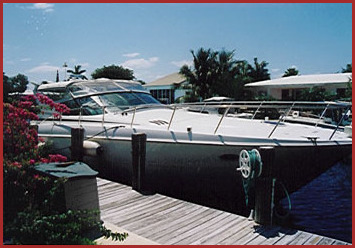 840 is not a lot of horse power for this boat that comes in at only 28,000 lbs., but she'll cruise at a solid 22-23 kn. without overtaxing the engines. Figure a tops of around 28 kn. With a 15 foot beam and very full bow, at best she's a coastal cruiser and isn't going to handle big seas very well. It was dead calm on our sea trial day, so we didn't even get a hint of heavy weather performance. The in-line Cats would not be my power choice for this boat if you're a speed demon, instead favoring the higher power 6V92's. Unfortunately, you can't get Detroit's in a vee drive configuration. The emphasis here is obviously on glitz and glitter. It's easy to be impressed by the style and glitter of a new boat, but at little more than two years old, the gloss of this one is wearing off fast, despite unstinting care by the owner. 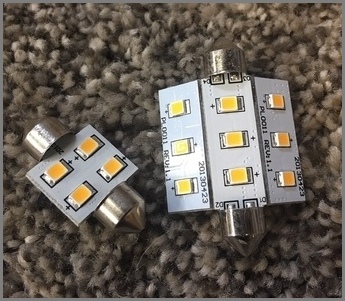 I couldn't help comparing the 440 Express to the 46 Maxum that we have also reviewed. The better quality Maxum was able to achieve for a considerably lower price is obvious. My impression is that style and faux luxury takes precedence over practicality and quality. This boat is giving us a preview of some serious maintenance and costly issues to be faced in the future. We'd like to be able to give a heads-up to a company that is trying to make a comeback. But what looks to be a good effort seems to have gone a bit too far astray in trying to wow us with too much fanciness, and not enough solid engineering. 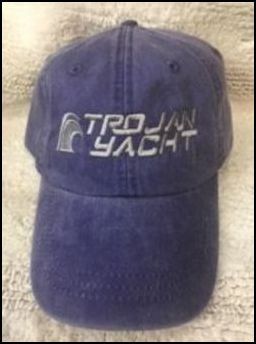 Trojan would have to do some some serious tweaking before we could give it a thumbs-up. In this price class, a builder had better be prepared to go beyond surface appearances and consider durability and service issues. How their products look and perform a few years later can cancel out a lot of costly marketing. We're constantly reminded that the ocean is still the ocean. It treats all products with the same relentless enthusiasm for destruction.